Liechtenstein, a landlocked alpine country in Western Europe bordered by Switzerland and Austria has a total land area of 61.7 square miles and a population of around 35,000. It is located entirely within the Alps and is among the richest countries of the world with the second highest GDP per person in the world. Its capital, Vaduz has been identified as a tax haven. Its financial sector is very strong with more registered companies than citizens. Other sectors of its economy are tourism, ceramics, food products, livestock, textiles, electronics, precision instruments and metal manufacturing. Since Liechtenstein is very expensive, tourists tend to skip the peak season months (June through August) and settle on the shoulder months instead. It has an impressive art collection, stamp museum and ski museum. Music and theater ingrained into its residents. The major attractions are the Vaduz Castle, Gutenburg Castle and ruins of Schellenberg. Winter sports are another draw. Cuisine of the place is mainly cheese, meat, and wheat based. Rich pastries and cakes are also their trademark. Lonely Planet Switzerland: Liechtenstein Kindle Edition B002RI9I2E $7 Includes history and background information. Trip planning information from Switzerland also included. The first stamps of Liechtenstein were a set of three stamps released in 1912 showing a portrait of Prince Johann II. The set (Scott #1 to #3) catalog for around $700 MNH and $70 used. A variety in thin unsurfaced paper released in 1915 is even more expensive and catalogs for around $2.5K MNH. Johann II was the Prince of Liechtenstein between 1858 and 1929. Johan II along with a Coat of Arms design and certain overprints were the primary stamp issues of Liechtenstein until 1920. After World War I, Liechtenstein foreign relations shifted to form a customs and monetary union with Switzerland and in 1924 Swiss Franc became Liechtenstein’s official currency. Liechtenstein released a long set of sixteen stamps in 1921 showing local scenes. The set (Scott #54 to #69) catalogs for around $1200 MNH and $350 used. The designs show Castle at Vaduz, View of Bendern, Prince Johann II, Old Roman Tower at Schaan, Gutenberg Castle and Red Tower at Vaduz. A long set of fourteen stamps released in 1930 showing local scenes. The set (Scott #94 to #107) catalogs for around $1500 MNH and $800 Used. The designs show grape girl, chamois hunter, mountain cattle, courtyard of Vaduz Castle, Mount Naafkopf, Chapel at Steg, Rofenberg Chapel, Chapel of Saint Mamertus, Alpine Hotel at Malbun, Gutenberg Castle, Schellenberg Monastery, Castle at Valduz, mountain cottage, and Prince Francis and Prince Elsa. A set of three stamps released between 1944 and 1945 showing Prince Franz Joseph II, Princess Georgina and Arms of Liechtenstein along with the Vaduz Castle. The set (Scott #215 to #217) catalogs for around $40 MNH and $60 used. The country remained neutral throughout World War II. Prince Franz Joseph II of Liechtenstein was the sovereign Prince of Liechtenstein from 1938 until his death in 1989. He was a very popular leader credited with transforming the economy so as to become one of the richest countries in the world. 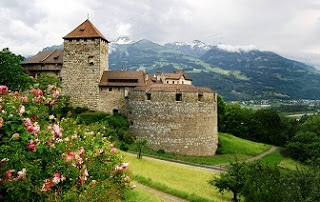 The 12th century Vaduz Castle was renovated between 1905 and 1920 and has been the primary residence of the Liechtenstein Royal Family since 1938. It overlooks the capital city of Vaduz. A set of twelve stamps released on May 3, 1951 in the Industrial theme. The set (Scott #247 to #258) catalogs for around $130 MNH and $45 used. The designs show boy cutting bread, laborer, cutting hay, harvesting corn, load of hay, wine grower, farmer and scythe, cattle raising, plowing, woman with potatoes, potato cultivation, and tractor with potatoes. Although the country was in dire financial trouble following the war, its early industrial focus was richly rewarded as its low corporate tax rates attracted many companies to the country. Today, the country’s citizens enjoy one of the world’s highest standards of living. A long set of fifteen stamps released between 1972 and 1973 in the Landscapes theme. The set (Scott #513 to #527) catalogs for around $10 MNH or used. The designs show Silum, Lawena Springs, Ruggell Marsh, Steg at Kirchlispitz, Fields in Schellenberg, Rennhof of Mauren, Tidrufe Vaduz, Eschner Riet, Mittagspitz, Three Sisters at Schaan Forest, Saint Peter’s and Tower House of Mals, Road at Frommenhaus, Ox Head Mountain, Hehlawangspitz, and Saminaschlucht. A set of four stamps released on September 4, 1989 showing Mountains. The set (Scott #911 to #914) catalogs for around $5 MNH or used. The designs show Falknis, Plassteikopf, Naafkopf, and Garselliturm. The alpine terrain of Liechtenstein is mountainous and that along with the mild climate due to the southerly winds make it a prime winter sports location. A set of ten stamps released between 1996 and 1999 showing paintings of village views by Marianne Siegl based on sketches by Otto Zeiller. The set (Scott #1068 to #1077) catalogs for around $25 MNH or used. The designs show Eschen, farmhouse at Saint Josephs Chapel of Planken, farmhouse at Ruggell, postal auxiliary office at Nendeln, buildings of Triesen, upper village of Triesen, Saint Theresa’s Church at Schaanwald, rural houses, barns, and Gamprin, parish church at center of village in Triesenberg, and the Vaduz Castle. Paintings are a common theme on Liechtenstein stamp issues and that make it a very collectible theme. The first coin of Liechtenstein was principality standard coinage Silver Thaler issued in 1862 with low mintage. Gold and Platinum varieties were also issued and the coins fetch well into the 1000s. Reform Coinage (100 Heller = 1 Krone) debut in 1900 with the introduction of Silver Krones. Coins from that period have relatively high mintage (upwards of 35K) and are valued upwards of $40 for UNC. The coinage of Switzerland was adopted in 1921 (Reform Coinage – 100 Rappen = 1 Frank). Liechtenstein have issued several gold coins and proofs over the years and they are generally valued at a good premium over bullion value. Coins $5 and up Common UNC Euros start around $5. High Value UNCs, Year Sets, etc start around $15. Commemorative Silver Proofs start around $50. Low Mintage Recent Silver Proofs, Early 20th century silver coins in BU, etc go into the 100s. Paper Money $10 and up Common Euro UNCs start around $10. Hellers from the 1920s in UNC start around $30. Scare Notes, Year Sets etc in UNC start around $50. Postage stamps, wine, hand-painted pottery and ceramics and art are the typical souvenirs of the place. Miscellaneous Collectibles $5 and up Vintage panoramic postcards, patches, pins, etc start around $5. Vintage Liechtenstein Alps Beer Steins start around $25.